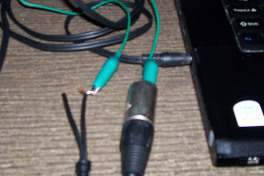 Today I learned the "fox and hound" method of finding a break in an audio cable. Although specialized equipment can be bought for this for from 50 to 100 USD (or higher for better), it turns out that it is not too hard to do with items that you probably already have lying around the house. A friend had an XLR cable that he'd been having intermittent trouble with, so I offered to take a look to see if I could repair it. When I put it on my cable tester, I found right away that pin 3 was not conducting. However, the solder joints all appeared (and tested) to be fine, so the problem had to be a break somewhere in the cable. I couldn't find obvious damage with a visual inspection, so I researched how to find a break in a cable, and learned of the "fox and hound" method. Fox and hound is pretty simple. You put a tone generator (the fox) on the wire that you want to test — it need not create a complete circuit — and then you run an AM radio tuned to static (the hound) down the length of the wire. Before the break, there will be interference from the tone generator's signal, which you will be able to hear on the radio. After the break, there will be no interference, so the static that you hear will be the same as when no wire is present. For a tone generator (the fox), I used my laptop with the program signalgen by Jim Jackson. 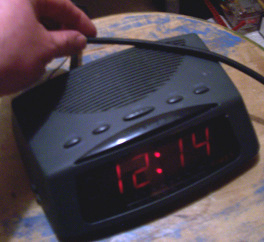 I used an ordinary clock radio for the hound. I set the radio on a stool, set it to a band with uniform static, and passed the cable over it. I did a bit of experimentation with known good wires, connected and not connected, to get a sense of what to listen for in the static on the radio. Once I knew what to listen for, it was easy. When cable connected to the computer was dragged over the radio, there was a sharp, loud, crackling added to the static. It didn't even seem to matter whether the computer was playing a tone — as long as the cable was electrically connected to the computer, I got the interference. I'm kind of puzzled about that, and if anybody can tell me the reason for it, I would love to hear. Here is a picture of the computer connection to the wire being tested. A severed headphone cable (that happened to be handy) is connected to pin 3 of the XLR cable via clip lead. You may need to experiment with the best place to pass the cable past the radio. Precision is less with this method than with the specialized kits that you can buy, but it's good enough for testing audio cables like this. Using this technique, I connected and tested the cable both ways, and found that one way, I could hear the interference down the entire length of the cable, and the other way, not at all. That indicated that the break was close to one end (within precision of the aparatus). I cut off a bit of that end, and found the break, right where the fox and hound test showed it would be. I verified that the remaining length of the cable was good, and resoldered the connector to the new end, tested the completed job, and declared an otherwise perfectly good cable saved from from the trash. Well, that's what I learned today. I was most impressed with how easy it turned out to be to find a break in a cable without any special equipment.